As an essential component of all living cells, aminoacyl-tRNA synthetases (aaRS) are a family of enzymes that catalyze the first step reaction in protein synthesis. This required function for all living things has been conserved in evolution – existing in lower organisms (such as the roundworm) and in higher organisms (humans) – thus, validating aaRS as ‘’ancient enzymes’. Dr. Yang is a leading scientist in aaRS research, joining NFCR-sponsored scientist Dr. Paul Schimmel in the discoveries that these ancient enzymes also carry other vital, yet unexpected biological roles. Using a cross-disciplinary approach including structural analysis, biophysics, biochemistry, and cell biology, her team is revealing mechanistic insights of aaRS roles in formation of cancer and neurological processes. Armed with a 3-D picture of aaRS and their new biological roles in mammals, the lab proceeds to develop promising therapeutic strategies. Dr. Yang has recently discovered that one aaRS enzyme for the amino acid Serine, or SerRS, has a role in regulation of blood vessel growth or angiogenesis – a process vital to cancer development. Tumors require their own vasculature system, providing vital oxygen and nutrients essential for cancer to thrive and grow. 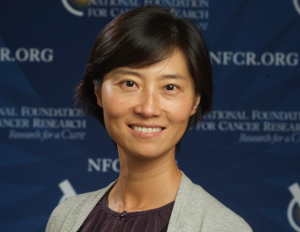 Dr. Yang’s team determined that SerRS interacts with and inhibits c-Myc, one of the most significant cancer-causing or oncogenes that is upregulated in many types of cancers. c-My controls downstream genes including the gene for key blood vessel growth factor, VEGF. By inhibiting the expression of VEGF, tumor blood vessel formation is shut down, starving tumors of nutrients. SerRS is likely a potent suppressor of cancer progression and metastasis. Dr. Yang’s team is expanding this critical area of research and may lead to novel therapeutic applications. Another aaRS of heightened focus for Dr. Yang’s lab is GlyRS, the enzyme for amino acid Glycine. The team of scientists have identified and continue to explore GlyRS as an important regulator in cancer associated cellular processes such as cell-cycle progression. Xiang-Lei Yang, Ph.D., received her B.S. in biomedical engineering from Capital Institute of Medical Sciences in Beijing, China in 1993, and then went on to earn her Ph.D. in Biophysics and Computational Biology, University of Illinois at Urbana-Champaign. Currently, Dr. Yang is Professor of Molecular Medicine at The Scripps Research Institute. She is also a Visiting Fellow, Institute for Advanced Study, Hong Kong University of Science and Technology. Dr. Yang is the Founding Chair, Translation Machinery in Health & Disease Gordon Research Conference, 2015. Dr. Yang has authored or co-authored more than 72 articles, many of them in high impact journals. She is the co-founder of biotech company, aTry Pharma, which focuses on developing tRNA synthesase-related molecules for therapeutic applications. Your ticket for the: Xiang-Lei Yang, Ph.D.